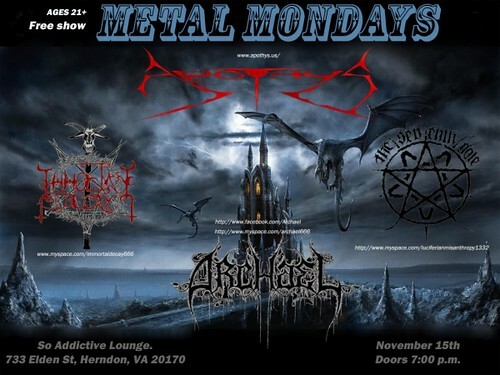 So Addictive Lounge is a small venue out in Herndon, Virginia that’s been having a weekly Metal Monday showcasing mostly local metal bands. As such, I’ve heard a lot about this place since most of the local bands I try to follow seem to play there sooner or later. This evening, Monday the 15th of November 2010, they were having a free show so I figured I’d head out and catch the bands playing and finally get to check out the venue. So Addictive isn’t a very large venue, it’s really more of a bar with a small stage set up. The stage wasn’t large enough for anything besides the drum kits, so for all the bands playing everyone but the drummer was on the floor with the audience. It’s kind of cool because the audience is right there with the band while they play. The room got very dark, but that wasn’t bad considering the bands playing this night. The beer selection wasn’t good for a bar though, they had nothing on tap and their bottles were almost all yellow beers (they did have Guiness and Yeungling, but when I ordered one of the latter, it tasted so skunky I didn’t bother getting another). Also, this was the night the Washington Redskins were embarrassed by the Philadelphia Eagles on Monday Night Football to the tune of 59 to 28, so the metal was a good way to become distracted from that disaster on the TVs in the bar. The first band up was a band called Frank Palkoski, or Palkoski, or the Seventh Gate (or all of those?). I’m not really sure what they prefer to go by really but that’s not a big deal. I thought they were going to be a black metal band judging by their logo on the flyer and the other bands playing, but they were actually a three piece grind band more similar in sound to Pig Destroyer than any of the other bands playing that night. They cranked the fog machine up and really let loose with the intensity. They started the show off like a blaring alarm clock on a morning you don’t want to wake up, if that alarm clock was an air raid siren. Their sporadic bursts of raw energy were broken up by some cool guitar riffs and drum beats, often suddenly interrupted with screams of anger. It was entertaining and a good way to start off the show. They had some burned CDs of their material they were giving out in clear plastic Ziploc bags they’d placed on the floor in front of the mic stands and I made sure to pick one up. They also threw a couple of shirts to random people in the audience, which was cool. The next band up was Archael, who I’d also never seen before. They are a standard black metal band heavily influenced by the early 90s Norwegian scene and they had some catchy riffs. The singer got a bit rowdy and jumped in the crowd a bit to mosh I guess, which was fine until he came over to the side and pushed me holding my camera. I put the camera away and grabbed a beer after that, I’m not trying to damage my gear. Regardless, they did have a lot of energy and the lead guitarist was getting people as excited about the music as the vocalist was. They’ve got their sound down pretty well, though they could use a bit more variation in the songs. They were good songs, but you can tell they are still growing as a band and I think once they change up the formula a bit they’ll have a really interesting set to play. 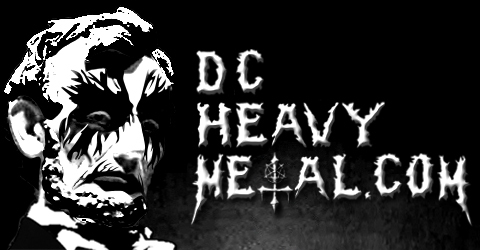 I’d like to see which direction these guys go as they stray more from their influences and form a more distinct sound for themselves in the future, as they really do know how play some fast and brutal black metal. 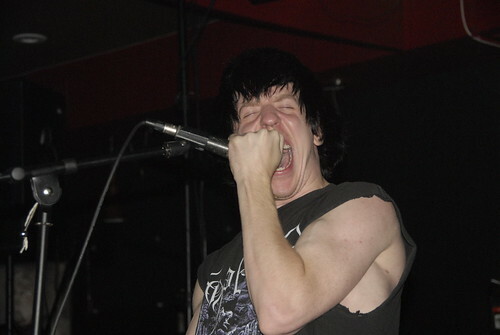 The next band to play, Apothys, I’ve seen a few times now, and I will see them play again next weekend at Jaxx. That’s not a bad thing at all since they’re really fun to watch live. I won’t get too into the details here as I’ll probably cover them more in the next review (and I’ve already reviewed their set at the Blood & Fire Festival here). This set was pretty fun though, it was cool to see the band interact with the audience due to the lack of a proper stage. 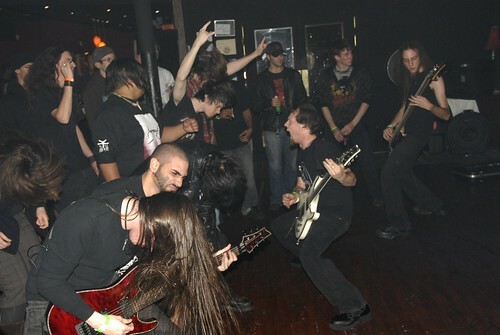 I mean just look at this shot of guitarist Eddie Misery leading the crowd members at headbanging, while standing in the audience and playing guitar! 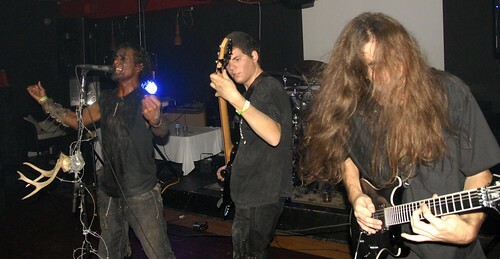 They played their own style of blackened death metal very well and the crowd really got into the show. Their final song, Of Writhing Eyes, seemed to really get everyone going nuts. 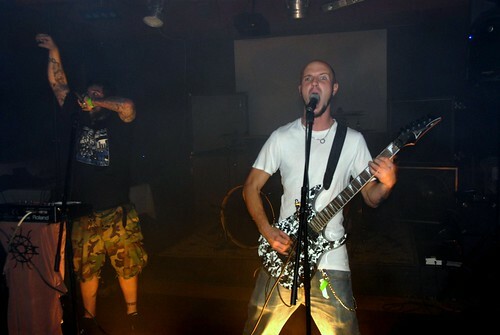 It was another great performance by the leaders of Northern Virginia’s death metal scene. The final band of the night was Immortal Decay, another band I’ve seen a few times now. By this point it was getting pretty late and there weren’t as many people there. That’s a shame because these guys are really starting to come into their own as a band. The room was very dark when they played, and the band didn’t screw around talking between songs too much. They played a cover of Satyricon‘s classic Mother North which everyone seemed to enjoy (how can you like black metal and not?). Their vocalist, Viktor Osorio, kept it interesting, even rolling around on the ground a bit (careful with those spikes!). The set seemed short though and sort of abruptly ended, maybe due to time constraints at the venue as it was well after 1am by the time they finished. They were fun as usual, and you can catch them opening for Watain at Sonar in Baltimore on Nov 30th (more details on my upcoming concerts calendar page) if you want to see them in action. If you can, buy a ticket from the band members as they have them for sale without service fees. In all the show was a lot of fun. Not a bad way to spend a rainy night in Northern Virginia, even though Herndon is a bit of a drive for me. It’s nice to see more of these local metal nights popping up around the area, and I hope to attend more in the future, just wish I could bring my own beer to this venue! I’ve got videos posted below, but since it was so dark for most of the sets, and my camera doesn’t adjust to low lighting well, they’re mostly just good for getting a chance to listen to the bands yourself. Enjoy! It was definitely a good night for metal.